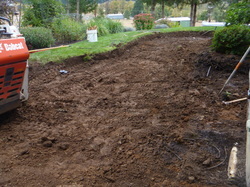 Graham Landscape and Design LLC designs, installs, and maintains residential and commercial landscapes in Creswell Oregon. 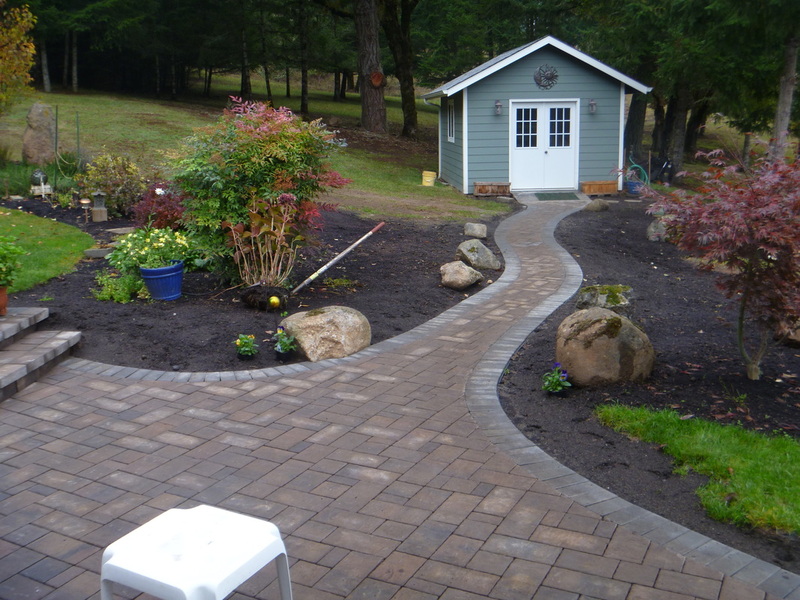 Pictured to the right is a paver patio, paver walkway, and landscape designed and installed by Graham Landscape and Design LLC in Creswell Oregon. The Problem: This homeowner in Creswell Oregon entertains family, friends, and neighbors on a regular basis. Unfortunately, the concrete patio that was installed when the home was built could not accommodate all of her guests and patio furniture for everyone. She was also tired of the same old grey concrete look. In addition, she needed a stable, clean surface to walk to her garden shed and to make it to the front yard without having to step in wet grass or plant beds. 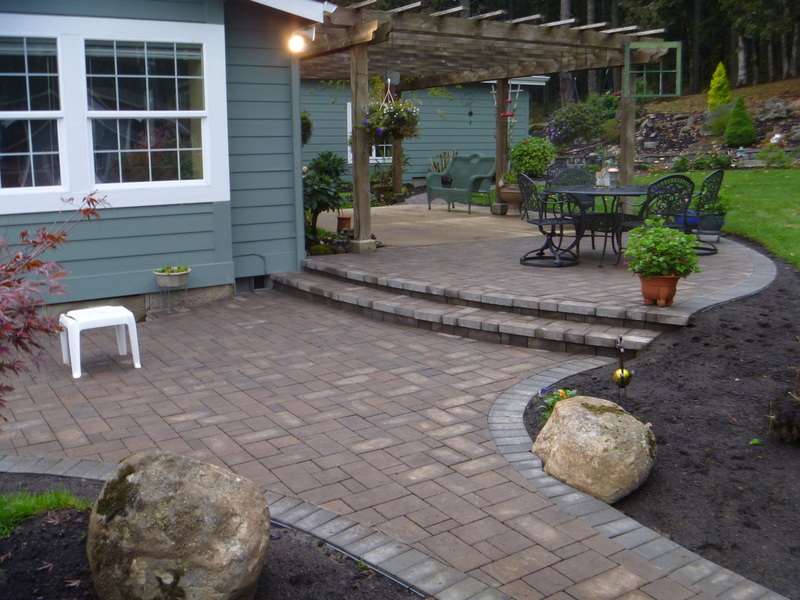 The Solution: Graham Landscape and Design LLC created a landscape solution to these problems by recommending and designing a beautiful paver patio and pathways for her Creswell Oregon landscape. 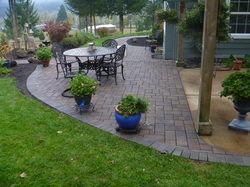 We worked with the Mrs. of the house very closely to select the perfect paver, paver color, and texture. Together, we decided on a paver and design that fit her budget and her desired look. We settled on the "Summit" paver in an "Umpqua" color. 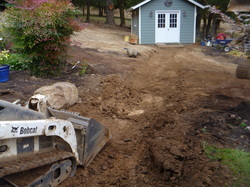 Graham Landscape and Design LLC prepped the area by excavating approximately 10" of soil. We overbuild our hardscape projects to make sure they can withstand the test of time and frequent use. We then laid a heavy-duty woven geotextile fabric used on roads and highways. This keeps the imported gravel from mixing with the native soil. We imported a "crushed" gravel (with fines in it) and used a special vibratory compactor to ensure a solid base for the hardscapes. We then screed an inch of bedding sand over this compacted base so that when the pavers are laid and compacted they are "locked" in with each other and the bedding sand. Then, we laid the pavers and cut them to fit the design and the curves laid out on the plan created by Graham Landscape and Design LLC with the homeowner's input. We then fill the joints of the pavers with a "polymeric sand". Once the polymers are activated (through a light misting of water), the joints harden and this adds additional stability to the patio and prevents ant mounds and weeds from growing in the joints. Now this homeowner in Creswell Oregon can entertain on a regular basis in her outdoor living space and not have to worry about cramped outdoor entertaining space for her guests. She can also make it all the way around her house and out to the garden shed on a clean, stable and beautiful hardscape that comes with an industry leading warranty! To view another Creswell Oregon landscape project by Graham Landscape and Design LLC, check out this waterfeature project.